I buy alot (ALOT) of patchwork and quilting books. I am embarrassed to share with you that I often flip through them.. think ‘meeeehhhhhh’ and that is it. Another mildly expensive mistake. After buying another ‘meeehhhhh’ book a couple of weeks ago I decided that I should review and promote the really good ones I have. The ones that stand out as being well written (by someone who understands our art) and have something really informative to offer. So on the first Friday of each month from now on, I’ll be doing a book review under the hashtag #fridayreads. My blogs come out weekly on Thursdays, so for that week it will appear on a Friday (or late on Thursday Night) and will have my take on the book I am reviewing. WALK – Mastering Machine Quilting with Your Walking Foot, by Jacquie Gering, first caught my eye because I teach a lot of ladies who seem to feel they have failed with quilting because they don’t enjoy free motion quilting (FMQ) and would dearly love to whip up one of the professional FMQ designs we see at shows or in books. This book really resets the view on Walking Foot Quilting and by the end of it you are buoyed by the fact you need never HAVE to FMQ again. 🙂 Alternatively, if like me, you do enjoy FMQ, it has taught me some excellent lessons which I will apply to my pieces nevertheless. In fact, I am itching to make book covers with my Junior Sewing Bee when they are back on Monday. Do you skip the introduction pages of a book? I do. I want to immediately get into the body of the book, however, this book starts with a chapter called Walking Foot 101. It shows you how to test your foot, and also how either utilise the markings and spacings on your foot or how to mark it up for success. 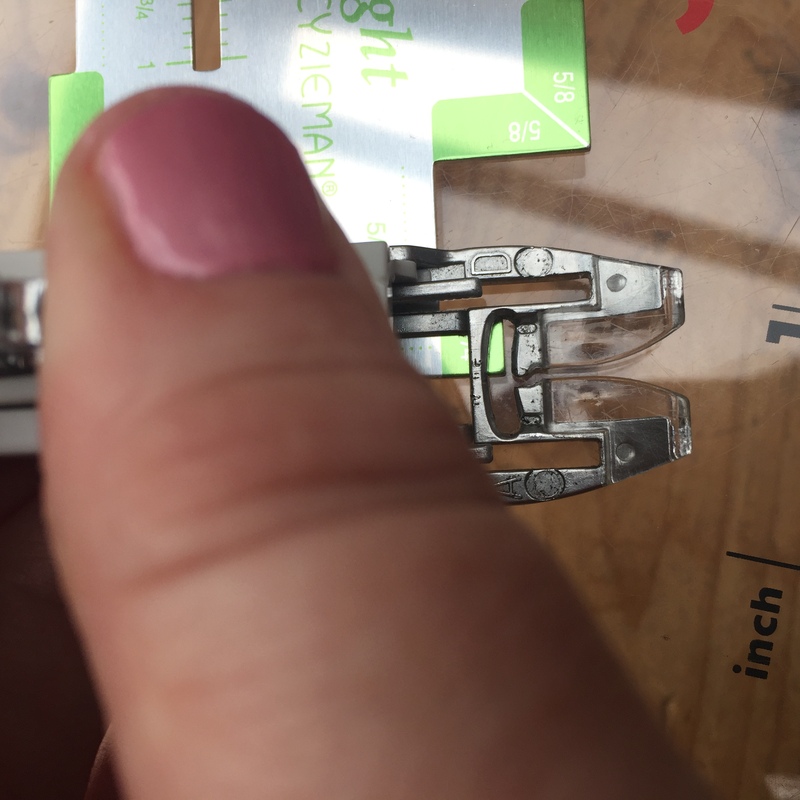 After reading this section I immediately got out my seam guide and started measuring all over my foot – and what a difference that made to the samples I was about to work on !!!!! For me, this chapter was worth the price of the book alone. The picture here is not only of my thumb .. it is of me checking the distance from where my need would be coming down to the internal edge of the walking foot – which is precisely 1/4″. 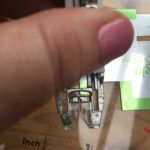 I went on to mark my 1/4″ and 1/2″ turning points (something I’d guessed at in the past) and also create a mark to help me with curves – genius! The book is really well produced. 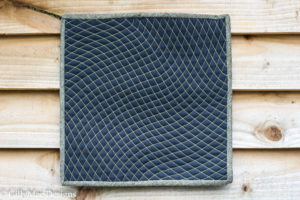 It is full of helpful diagrams to follow and many many pictures of Jacquie’s gorgeous quilts. The book takes you through quilting lines, curves, quilting decorative stitches as well as quilting in reverse (who knew!!) and provides designs which are achieved by turning the quilt. It concludes with a gallery of quilts made by Jacquie herself. I also created a fan and then added some zigzags within the fan. This took a bit more marking, but the effect is great. This could be used or adapted to be used in any shape. I think it would look amazing within a set of semi-circles. The tutorial for the nested diamond involved drawing a grid and then marking the turning points in the grid. I drew my grid really carefully and was a little slapdash with the turning marks, but I like the effect and can think of multiple uses for it. 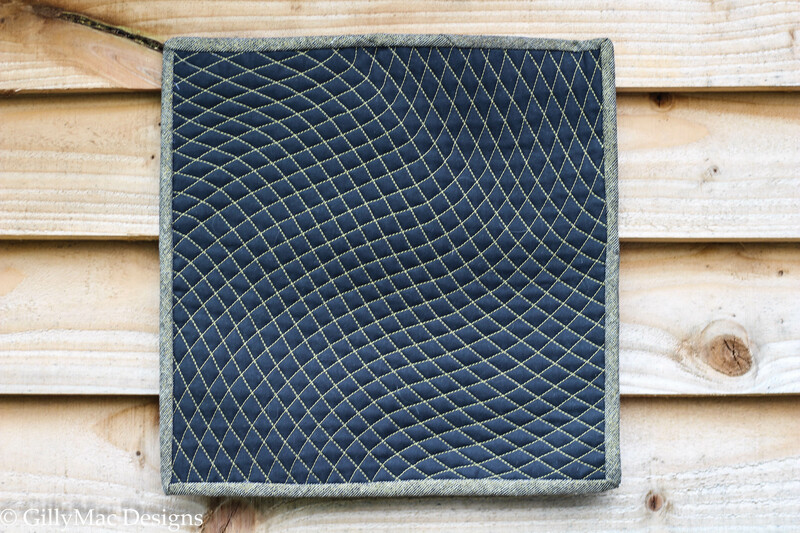 This design also pops the quilt, really defining the areas quilted and not quilted. 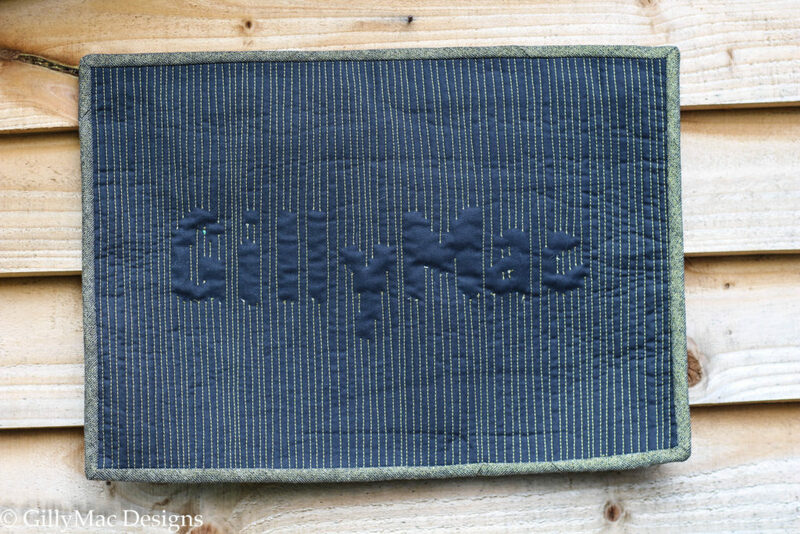 My final sample for this review was to use matchstick quilting to write a name.. Jacquie recommends this for smaller projects as it does take time and lots of thread. That said it was worth all the effort. I went off-piste here and used lock stitches at the start and end of each letter. I should have used Jacquie’s small stitch method as I think it would have been neater. I put this small error down to the excitement of making this work! 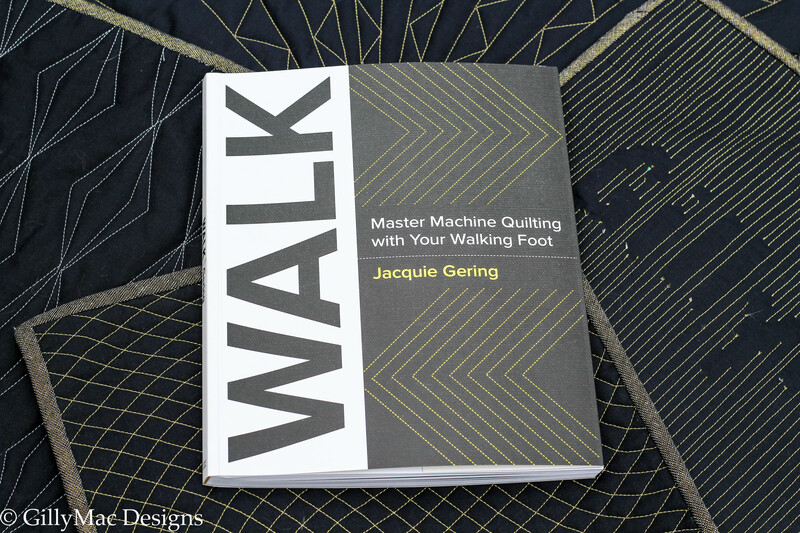 WALK is by Jacquie Gering and is published by Lucky Spool. I loved it – can you tell ?? If you are on Instagram, you can follow Jacquie via @jacquietps. In addition, you may also want to follow @sarahashfordstudio who is also making samples and videos of lessons from this gorgeous book. It’s not just you… it is me too…. ! Just lately I have been backing up things to quilt. Sometimes it just happens. I end up with a number of requests for classes and I get the tops made and then slow down at the point of quilting. Often it is because I am musing about a designs to use, but it is regularly about the ‘will it be good enough’ fairy siting on my shoulder (she sits there quite often). The thing is, as with almost everything I do, if a task is simplified, broken down into chunks and sometimes even scheduled, it all gets done and most times is great ! 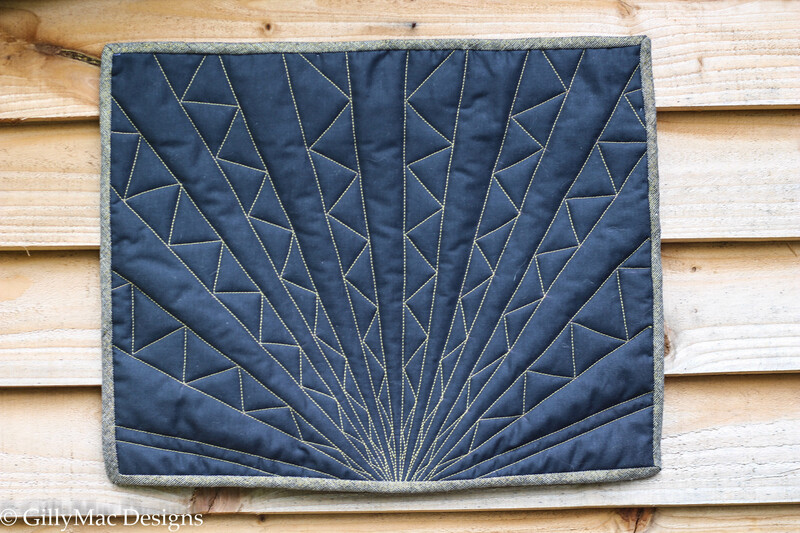 The Northern Lights Quilt was an opportunity to stretch myself and practise new designs, but there was much blank space, with no lines or seams to use as guides. So the challenge was to decide what to do, and to start.. just do it ! The Circles Table Runner was a class sample. 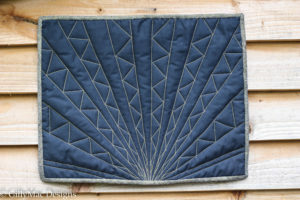 It needed to be quilted with clean clear, well executed designs which could be replicated in classes. I wanted this to demonstrated how effective walking foot quilting could be. The Library Quilt was a large project which was daunting in itself on a domestic machine. I wanted to quilt the books using a walking foot, to define them and make them stand out. This would be simple quilting, but will involve a lot of twisting and jiggling of the quilt through my machine. Then for the background (blue) behind the books I planned to do some stiff free motion work. Maybe a paisley design. 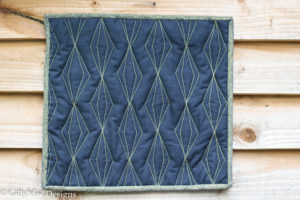 This quilt is a wall hanging, not a functional quilt and this lends itself to heavier quilting. The size of the quilt means that FMQ will be easier on the machine. After a week of work … and a lot of ‘having a go’, oodles of tea , the Northern Lights and Circles quilts are finished and the Library quilt is a ‘looking good’ working progress. Circles Table Runner – Quilted ! It has been really rewarding to just throw myself into it and not worry about small mistakes. I love the finished effects… Now it is your turn… go on.. have a go !